I’ve been busy. So busy that I missed Cal Tjader’s birthday, a wrong that is being writed (the pun makes up for the not good grammar) now. Cal was born 16 July, 1925, which woulda made him 92 this year. So here’s to Cal Tjader! The last Tjader album I wrote about was a straight-ahead jazz album, so back to his Latin jazz we go. I couldn’t decide between the two tunes above, which are my favorites on this album, so both were profiled. Tjader had just recorded ‘Mambo Inn’ with George Shearing shortly before he went into the studio for his own cover of the now-classic song. ‘Bernie’s Tune’, popularized by Gerry Mulligan and Chet Baker, gets its first Latin treatment, and is a great example of how Tjader was able to transform a jazz standard into an authentically Cuban form. The album features Cal Tjader on both vibes and timbales, showcasing his blossoming percussion talents. Armando Peraza, another Shearing band member, lends his percussion support, as does bassist Al McKibbon (another Shearing member) and pianist Eddie Cano (never a Shearing member). Together, they make music that is authentically Latin, yet distinctively jazz, too. Even today, the cover is still kind of risque, and I always keep it out of sight from other people. Back in the mid-1950’s, I’m sure this was a big deal. What does a naked lady dancing (or posing like she’s dancing) have to do with the music? Not sure. 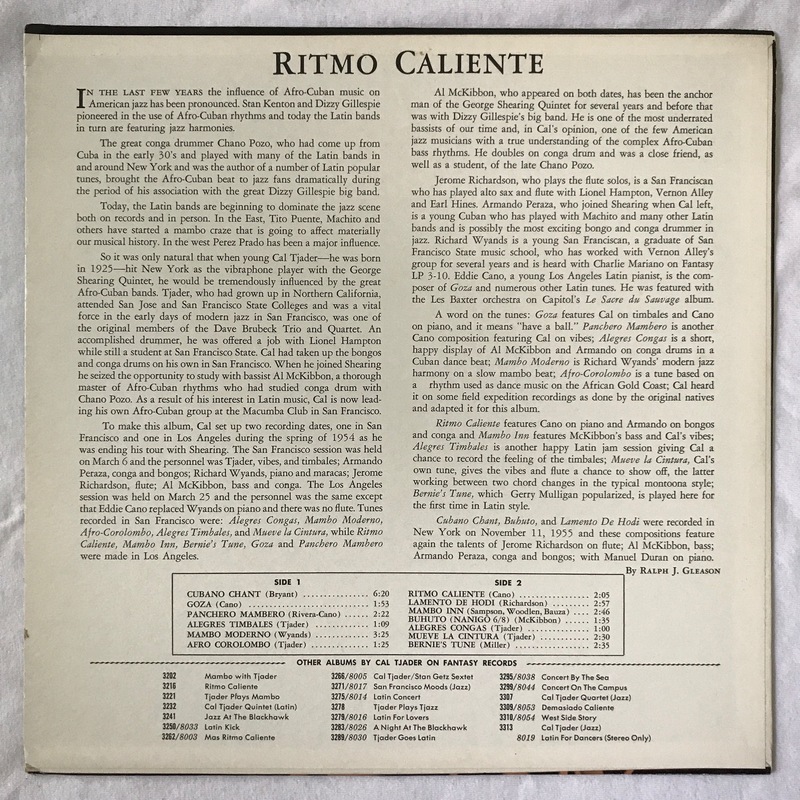 The album’s title, ‘Ritmo Caliente!’, is wrong. In Spanish, if there’s an exclamation point, there’s one at the front and one at the end. 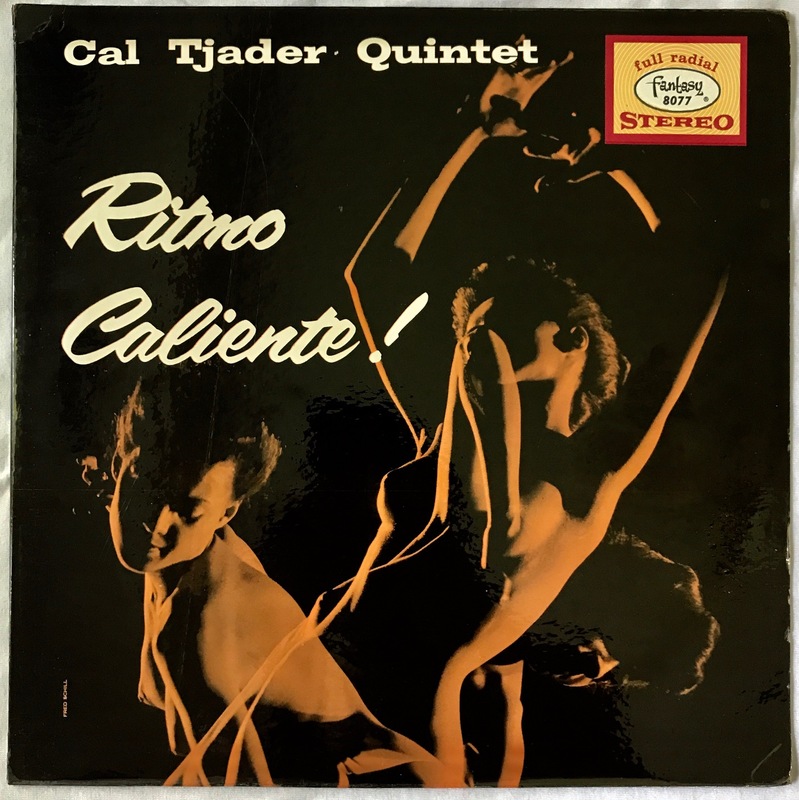 Ritmo caliente loosely translates to ‘hot rhythm’ or ‘hot pace’, which again doesn’t really jive with the naked lady. HOWEVER, the multiple exposure shot is pretty artistic and neat. It’s a striking cover, to be fair, but Mr. Fred Schill and the marketing folks at Fantasy Records knew what they were doing. As was usual for Fantasy in the 50’s and 60’s, the stereo versions of albums were pressed on cobalt-blue translucent plastic. Despite all of Fantasy’s shortcomings, they were futuristic in many ways, one being their colored vinyl, and another being that they began taping some of their record sessions in stereo in 1954. I’m not sure if this album is an example of that or if it was engineered in the sound booth to became stereo, but the audio quality is rather nice, boasting high fidelity and non-spacey stereo. For pre-1957 stereo, it’s pretty good. The vinyl itself (well, plastic) is in almost mint condition, making for a relatively quiet listen, and is a shallow deep-groove. eBay was my good friend in my early days of record collecting, and it treated me well. I stumbled upon this listing on eBay one morning in class (I’m not proud of it, but hey) and when I saw that it was below $20 AND in mint condition, I jumped for it. A week later, I was the proud owner of this album. It’s not particularly rare, although many of Tjader’s albums on Fantasy seem to be in low numbers online.